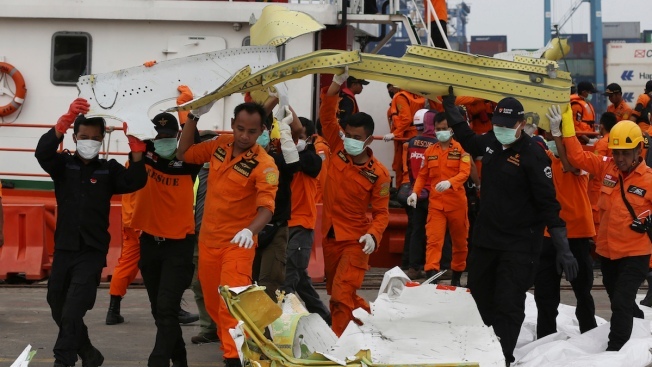 Rescuers remove parts of the Lion Air jet that crashed into Java Sea on Monday at Tanjung Priok Port in Jakarta, Indonesia, Saturday, Nov. 3, 2018. Divers reported seeing the fuselage and engines of the crashed Lion Air jet on the seafloor and a ping locator has detected a signal that may be from the cockpit voice recorder, Indonesia's search and rescue chief said Saturday. The brand new Boeing 737 MAX 8 jet plunged into the Java Sea just minutes after takeoff from Jakarta early Monday, killing all 189 people on board. Local media reported Saturday that the search effort had claimed the life of a diver on Friday evening.